"On Monday we had a more relaxing day planned, although it was a long day. We took another boat but this time out to sea, 25km south to Koh Kong Island. It�s the biggest of Cambodia�s islands but isn�t inhabited so after a couple of hours on board we got to a completely deserted beach lined with coconut groves, moored and swam in the clear water. It was so warm as well � just perfect." Koh Kong Island (or Koh Moul), the biggest island in Cambodia, is 22 kilometers long and 7 kilometers wide. Koh Kong Island is 350 meters above sea level. Cambodia's largest island, and one of the less populated places in the country. 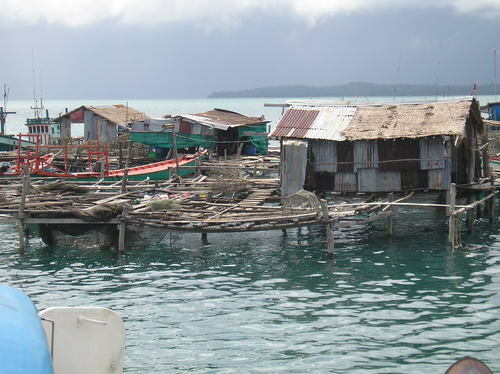 Koh Kong Island is the size of Hong Kong, and has the population of a large classroom. The island has many hills and is rich in natural scenery. Many names are used for this island: Koh Moul, Koh Mool, Koh Kong Krav, Koh Kong Island. It is said that there will never be a complete tour to Cambodia without the stop over at Koh Kong Island. 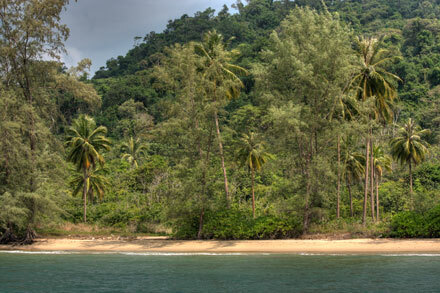 The main features of Koh Kong Island are trees, beaches, and more trees and beaches. Also, lots of water (The Bay of Thailand surrounds the island, as you would expect.) Today, it's water activities, chilling, and exploring. You can go walking along the beach of Cambodia�s largest Island until coming upon a freshwater lagoon. Laying in the shade and reading. And, as afternoon arrived, eating fresh barracuda grilled on the sand, with rice and vegetable curry and guzzling icy cold water. Koh Kong Island is only a few kilometers away from the charming town of Koh Kong City on the mainland. By boat it will take 40 till 120 minutes. Although much of Koh Kong Island still remains unexplored the tourism industry is flourishing and you will see some of the finest places of interest in Koh Kong Island. It's is only 24 km away from the centre of the town and you can hire a car to visit this lovely place. It is the natural splendor of Koh Mool Resort that attracts yearly thousands of travellers. On the west side of the island, beach No. 3, is one of the nicest Beach Resort in Cambodia and it offers bungalows laid out on a picture postcard beach. Here you can relax at the beach or make friends with a kayak tour and Jungle trekking. The island has more than 10 waterfalls that range from 6 to 25 meters in height. 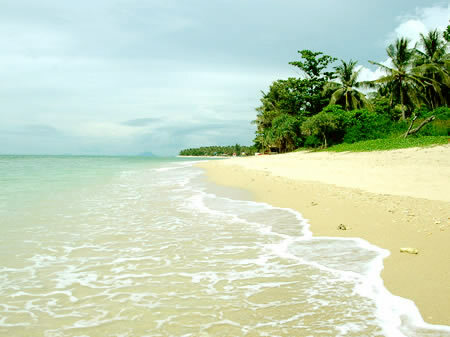 Koh Moul features 6 beautiful beaches, known as Deum Dong Beach 1 to 6, that range from 3,000 to 5,000 meters long. All have beautiful white sand and limpid water. The water surrounding the island are full of black and white dolphines that appear along the beach from 9 to 10:30 in the morning and 5 to 7:30 in the evening. Your kids will enjoy the dolphin show that is organized at the Koh Mool Resort (Kor Kong Krau). Apart from the lovely retreats one can find stunning cascading waterfalls. Travelers can also visit a number of small springs, and engage in dolphin watching. As you stand on the beaches you will be simply surprised to see the black and white dolphins which are fearless of human touch. A walk on the beach in the moonlight is also an experience you will never forget. The boat ride took 2 hours and we went via a mangrove sanctuary. Koh Kong island was absolutely pristine, well at least "Beach 3", where we stopped at for snorkelling. It wasn't the most amazing snorkelling. But probably the best we've seen so far on this trip. There were some cute little schools of fish and tons of mollusc shells and coral. After an hour or so the four us retreated to the beach for some snacks and laid around with Volker for the better part of the day. We all did manage to get back into the water and play around for a bit - chicken fights, basket tosses, dolphin impersonations. Around 2:30, we all piled back into the boat and head back to the mainland. It was a peaceful ride for the most part but toward the end of it the sea was really chopping and got abruptly woken up by a huge slash of water. Later that night the 6 of us from the boat trip (there was an English gentleman with us but he didn't talk much during the day) met up for dinner. It was a great night of drinking - well not Steph as her stomach was not doing so well - and playing cards.